Amatrol’s Motor Braking Learning System (85-MT5-A) adds to the Electric Motor Control (85-MT5) to expand a learner’s knowledge to the common electric motor braking methods found in industrial, commercial, and residential applications. Braking is essential to motor control when motors must be stopped and restarted multiple times. Common applications include rolling mills, conveyors, and power fans. Learners study industry-relevant skills for three of the most common braking methods: electromagnetic braking, plugging, and DC injection braking. Troubleshooting braking problems under realistic conditions allows learners to experience the challenge and reward that result from applied problem solving. 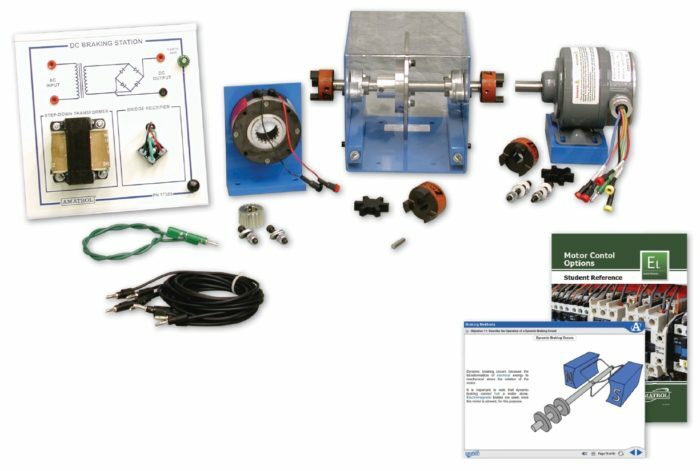 The motor braking training system includes a DC braking station with power supply, transformer and bridge rectifier mounted to a slide-in panel, inertial load module with flywheel, electromagnetic brake, plugging/anti-plugging switch, student curriculum, and instructor’s guide. This system uses industrial quality components that stand up to frequent use and enable learners to better prepare for what they will encounter on the job. Plugging, stopping an electric motor by reversing its magnetic field, is a relatively simple concept with complex and dramatic results. Amatrol’s motor braking training system covers three types of plugging: drum switch, push-button, and timer-controlled. This low cost, quick method has emergency application but does create significant stress and frequently does not bring the motor to a perfect stands still. Two other kinds of braking methods covered by this industrial motor control training system are electromagnetic braking and DC braking. Learners will study about the inner-workings of electromagnetic brakes, how to operate them, how the output from a DC braking station can be used to control them, and the advantages and disadvantages of using them. Learners then apply this knowledge by connecting and operating a motor braking circuit using an electromagnetic brake and a three phase induction motor. They will then connect and operate a motor braking circuit using DC injection braking. The included components are heavy-duty and industrial quality ready for repeated use. The DC braking station includes a DC power source, control relay, and step-down transformer. The motor braking system also covers motor braking troubleshooting by allowing learners to practice troubleshooting faults in an electrical motor control plugging circuit and a DC injection braking control circuit. Covering the major methods of electric motor braking, this industrial training system’s curriculum allows learners to use the theoretical knowledge that they’ve gained to complete hands-on skills like connecting and operating a motor plugging circuit to brake a motor in either direction. Other major topic areas covered in the curriculum include drum switch plugging, electromagnetic braking, DC injection dynamic braking, and much more! This system’s curriculum is presented in an interactive multimedia format that brings this vital industrial skill to life by utilizing audio, text, 3D graphics, and strong interaction to fully engage learners. A sample copy of this course’s Student Reference Guide is included with the learning system. Sourced from the multimedia curriculum, the Student Reference Guide takes the entire motor braking training course’s technical content contained in the learning objectives and combines them into one perfect-bound book. If you would like to inquire about purchasing additional Student Reference Guides for your program, contact your local Amatrol Representative for more information.